TouchPad is the Industry Leader in Advanced Level Quick-Turn PCB Assembly Prototyping. We service the who’s who in medical, aerospace, commercial, industrial, consumer, and some of the worlds most advanced research organizations. When quality, delivery and value are prime factors, TouchPad is the best in class for your prototyping needs as this is what we do! Employing only the industries best Electronics Technicians, Engineers and highly qualified veterans of the industry, to complete your assembly projects, Touchpad’s manufacturing staff is unmatched amongst its competition. We solve problems with our customers, we make things possible, and we don’t just place your project on hold. TouchPad Electronics is process driven organization with fully implemented LEAN, and 5s platforms with a manufacturing facility that would rival the cleanliness of an operating room. We ensure your data is sound, and that your build runs smoothly. All assemblies are built using our automated equipment operated by IPC certiﬁed EE Technicians and Engineers to the most rigid quality standards, allowing our customers to troubleshoot engineering issues in their new designs, rather than workmanship issues. We take organization and workflow to the next level which ensures a high quality product delivered on-time, every time. 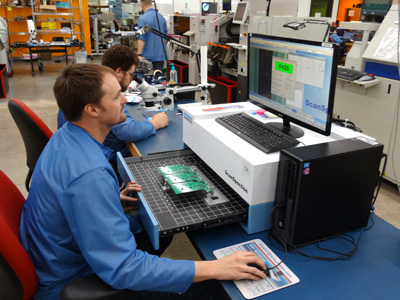 We are the industry leader and go-to facility for PCB assembly prototyping. Utilizing the latest equipment such as high-end flex placement machines, the highest quality optical inspection equipment, gold series paste printing cameras, and the latest in selective soldering machines. Unsurpassed process controls from component kit check-in to final inspection methods.